We’ve finally seen some life in Snap (NYSE:SNAP) in 2019, with shares exploding off its Dec. 24 lows. The stock has more than doubled from those levels as investors continue to bid Snap stock higher. In this regard, it’s somewhat reminiscent of General Electric (NYSE:GE) and its big rally from the December lows. However, the same question persists: Can Snapchat stock continue its rally? There are a few things to consider here. The first is that technology and the broader markets have momentum right now, and so do some of Snap’s peers, like Facebook (NASDAQ:FB). Should that momentum persist, I see no reason why Snapchat stock cannot continue higher as well. And keep in mind, I’m no raging bull in Snap. In fact, I have not liked this one very much at all over the years, save for a few short-term long setups on the chart. In that regard, let’s look at the charts to see what we’re working with. Snapchat stock rallied from $5 in late December to $7 in early February. For many, this 40% rally would be a sure-fire short. But investors have to realize that, even without solid fundamentals, rarely is it worthwhile to try shorting a stock to zero. The risk/rewards simply isn’t appropriate. Even at $7, the best case with Snap is picking up $2 on a winning short trade, while risking an unwind up to the $9.25 to $10 area. Compare that to early August, when Snapchat stock tested prior support near $13.50 and failed. That gave us an immediate target of prior support near $10.50 and a windfall below that. Plus, our risk wasn’t very high because a key level was just overhead. Enough of the history lesson, where can the stock go now? Over downtrend resistance (blue lines), the notable $10.50 level and all three major moving averages, and Snap stock has strong momentum. After getting a big boost last week on an analyst upgrade, Snap is consolidating the gains nicely. 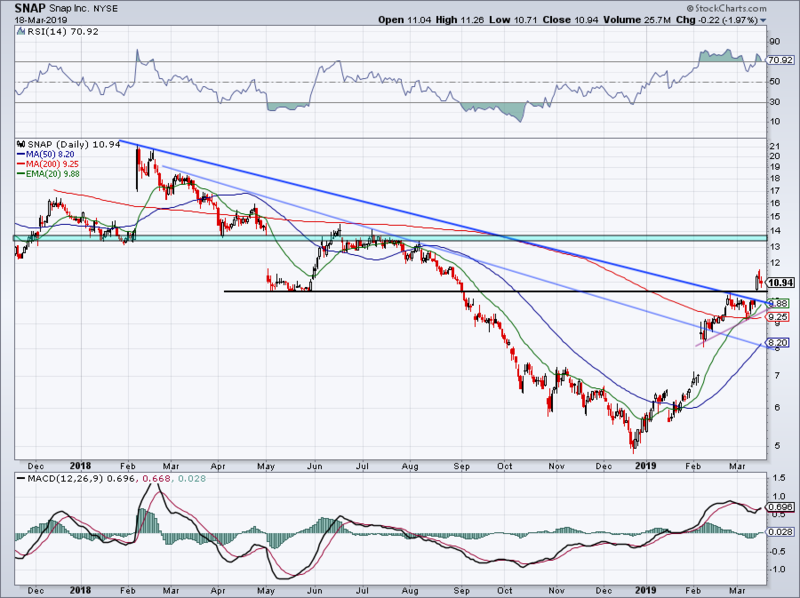 If it can continue consolidating over this $10.50 level, the odds it takes out its recent highs over $11.40 increases. From there, Snapchat stock can make its way up toward $13.25 to $13.75, up almost 25% from current levels. Of course, a move like that wouldn’t take place overnight. But there’s no reason to fight a trend until the stock breaks away from it. On the flip side, below $10.50 and the backside of prior downtrend resistance near $9.75 is the next line in the sand. So why don’t we like Snap stock from a fundamental perspective? Last quarter, the company grew revenue more than 36% year-over-year, beating analysts’ expectations and hitting a quarterly record. A loss of 4 cents per share came in 4 cents ahead of estimates too. It’s clear why Snapchat stock rallied so big off these numbers. The company’s strategy is becoming more clear as it invests in improving its content and making the platform more attractive for users. That’s great if it works. So far, Snap is only treading water. Daily users of 186 million is flat sequentially and year-over-year. On the plus side, revenue is up big despite that flat user count, but this is not something to hang your hat on. Here’s why I don’t like Snap as an investment. Despite the record revenue last quarter, the company still burned almost $150 million in cash. While its net loss improved by $158 million vs. the same quarter in the prior year, Snapchat stock still logged a net loss of $192 million. Ouch. Free cash flow over the trailing 12 months stands at an $812 million deficit. It simply can’t get out of the red. Currently, Snap has $1.28 billion in cash and short-term investments, down a whopping 37% year-over-year from $2.04 billion. On the plus side, Snap stock doesn’t have any debt. But if it can’t stem its cash-bleeding ways, it may need to raise capital. Getting to cash flow positive territory would be a much better alternative to taking on debt or selling equity. At this point, the stock is trading much better than the fundamentals would suggest. For now, we don’t bet against that. But we’ll re-evaluate down the road. The post It’s Time to Admit You Missed the Boat on Snap Stock appeared first on InvestorPlace.